Hi everyone! We’re starting the weekend off with a bang – well, a flash technically. 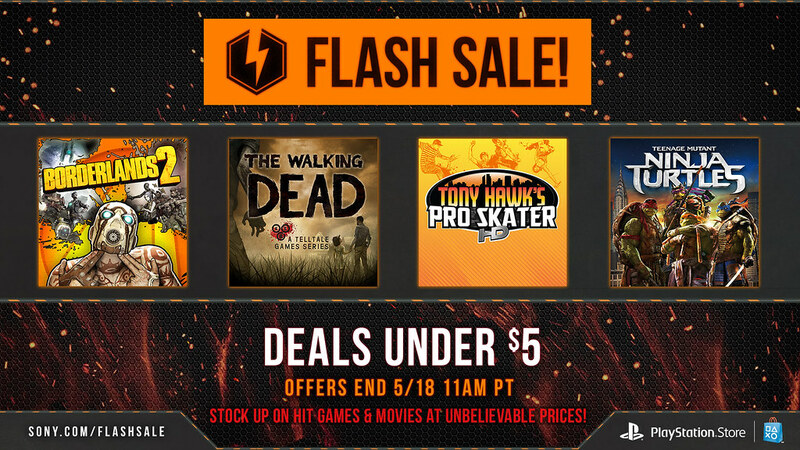 Our Deals Under $5 Flash Sale starts right now, with games for purchase and movie rentals to choose from – all for up to 90 percent off. Head over to PlayStation Store through the weekend to nab titles like Borderlands 2, The Walking Dead, Tony Hawk Pro Skater HD and rent blockbuster movies like Teenage Mutant Ninja Turtles, independent films like Sword of Vengeance, and more. Don’t wait too long, our Deals Under $5 Flash Sale ends at 9:00 a.m. Pacific on Monday, May 18. Let us know what you’re picking up. Have a great weekend! Mass Effect Trilogy for $4.80 is amazing! Never got into this series, but looks like I will now! Very disappointing to see the Borderlands 2 logo in the post and then seeing it’s only on sale for ps3. You guys have had that on sale multiple times before, not to mention it was already free with Plus. The other sales look pretty good though. I might take advantage of one or two. Missed getting Ni no Kuni the last couple of times it was on sale, so thank you so much for discounting it again. Freedom Wars less than $5? It was already cheap enough without the sale! Thanks Sony!! Now this is a sale!!! :D Thanks, Sony! Buyer beware regarding LittleBigPlanet Karting. Online is not functioning. I think the servers have been taken down. No answer from Sony or Media Molecule. Probably one of the best sales in a long time. Will be buying plenty, finding the time to play them is the problem. Still have games from previous sales that I haven’t even gotten to the title screen yet. Theses deals are too good to pass up. Freedom Wars for $4.80!? Great sale!! Is “The Wolf Among Us” the complete game or just episode 1? Thank you for sorting by platform. Sweet! I’ll easily drop $25+ on a handful of these! And thank you Chieh for bringing back the easier-to-see-what-an-awesome-deal-I’m-getting format! Was reading the list and saw Freedom Wars and went, WAIT, WHAT? Heck, I think I even somehow changed my keyboard settings in astonishment. Also going to hop on The Walking Dead and maybe a couple of others games. Not sure yet. Don’t Starve maybe. Now we wonder where are those kind of games now…. Awesome sale. Unfortunately I own many of these games already, but these are excellent games. $4.80 for arguably the greatest gaming trilogy ever is a steal. I’ll be picking up The Wolf Among Us and Freedom Wars. played nino kuni b4 and it was a great game but that boss at the end got in to my nerves,but all in all its just a gorgeous game.one question, are these movies just rentals or can you own them for life? because i all can see its are rental sales correct?? Quick question for whoever can answer: What’s the difference between buying The Walking Dead: The Complete First Season and The Walking Dead- Season Pass? im getting freedom wars and wolf among us definitely. is the mass effect trilogy worth playing people? Yes vita love…. freedom wars mortal combat frozen synapse and walking dead all for vita for me.. if borderlands is on vita sale that would be a instant buy.. thanks sony…. Damn. I’ve had $5 in my wallet for over a month and just a few weeks ago I used my Spanish account (I live in Spain but use a USA account) to buy the Mass Effect Trilogy for 15€. I should have waited! What now? Should I get NFS The Run since I miss arcade racing (especially NFS)? No No Kuni even though I don’t really like JRPGs and Japanese games except westernized ones? Should I save my money to save up for PS+ (just ran out and I have NO income. lol how can I save up?)? Or maybe Tony Hawk’s Pro Skater HD? Yes, very much. If you are into science fiction and RPG, that’s a must playing. Didn’t say anything during Tuesday’s Store Update, but this is why the lists are greatly appreciated. Sometimes, whoever does the store updating, misses some things. Case in point, I will be buying Raven: Legacy of a Master Thief. Had this just been another post, with links to the store, I wouldn’t have even known that was on sale. Happened during the previous flash sale, as well, where a few games not on the Store’s Flash Sale page were listed in one of these posts. Wouldn’t have known(and bought) Ratchet: Deadlocked then, either, had it not been for your list on the blog showing it was on sale. But anywho, thanks, for the sale. Probably buying a few things, just wanted to point out that bit about Raven(might be a few more listed not on the Store’s Flash Sale page, too; Raven is a game I was interested in, is the only reason I noticed it straight away). Question…I have Soul Sacrifice but haven’t started it yet. Is Delta worth the extra 5 bucks and skipping the original altogether? This is incredible, Sony – especially the PS Vita love! Thanks, I’m getting several games for and letting my friends know about this sale. @23 Whether you haven’t played the first or completed it, Soul Sacrifice Delta is worth full price and then some. It’s easily one of the best games on Vita, far surpasses the joke that is Freedom Wars in both story and gameplay, and any Vita owner that doesn’t take advantage of this sale (if they don’t already own the game) should turn their console in right now. Hey Sony. Borderlands 2 is on other consoles, you know. As are some of those Telltale games. Any reason why, once again, their Vita versions are left off this sale? I have the GOTY editions of ME on the PC, and was wondering if the PS3 bundle is the GOTY (All DLC) versions of the trilogy? I already plan on getting the YDKJ bundle and I heard great things about NiNo Kuni. I already own Peggle 2, it would feel so silly to pay $4.95 to buy the game all over again (but the FULL version), instead of spending $6 just to get the extra DLC separately. Wow! The flash sales are 100 times better than the weekly sales. This definitely makes up for the horrible sale week. Sony was definitely listening to all the complaints this week. I have a lot of these games already and I paid lot more than $4.80 and they were worth it. Just bought Trials: Fusion a few days ago…d’oh! Oh, well. Not sure if there’s anything I want, though. Great Vita sale thanks, I’m in for $28 at least on that amazing and sometimes unappreciated platform alone. Perfect timing as it’s coming into travel season at work. I was hoping that there would be a flash sale this (long in Canada) weekend and boom, I’m smiling. Meanwhile, I have a questyion for you guys. Here’s the deal : I only have a ps3, but have been willing to get Super Mega Baseball eversince its release. It really seems like a fun, family-friendly game and I’ve been disappointed with pretty much every baseball game since Baseball Stars 2 ^^ waaay back in the days. Now I see Super Mega Baseball is only $ 4,80 for a few days… but on PS4. However, the store description (based on what I read on the french/canadian store where I go) for this PS4 version says when buying PS4 version you get both PS4 AND PS3 versions… fo’real ? Can anyone (or a bunch ^^) who bought this weeks earlier please confirm that you actually, really, indeed, got the PS3 version once you bought it for the PS4 ? Thanks in advance for the answer(s) and sorry if I can’t add an extra thanks after this (leaving to work in just minutes). @28 BioWare’s webpage says Mass Effect Trilogy only includes some of the DLC. But it’s still a great deal. You’re getting 3 awesome games for $1.60 each. Now my turn to ask a question. Why does Don’t Starve on PS4 cost 1 cent less if you buy it without the expansion? This SHOULD be front page. very nice. i already got so many on this list but still good. a few i need to look into. wish the walking dead season 2 was here. either way keep it up, we clearly are obsessed with ah good flash sale. @35: yes that how it works for what Sony calls “cross buy” titles. Buying for one platform will add the other(s) format(s) to your download list too. So you can safely purchase it for PS4 and you’ll have both versions available for download. I have been wanting some racing games to go on sale and here we go. I’ll be picking up Moto Gp 14 for PS3 and Vita. The Mass Effect Trilogy seems too good to be true. Might just have to get NBA 13 PSP because I can play it on my Vita and we need more sports games on it. Fantastic Deals here! Anyone that doesn’t have Freedom Wars or Soul Sacrifice Delta grab them now. The 2 The Walking Dead games are good deals. I bought them a couple months ago and fun games. Not seeing anything else I’d be interested in though so maybe next month for me. The online “functionality” for LBPKarting has been disastrous for years now. It’s one of the worst things about the game. I’ve been trying to get the last two online trophies for years so I can platinum the game and finally leave it be. But it’s so bugged and glitchy the trophies never pop and I’m always getting disconnected. LBP is one of my top Sony franchises and it’s HEARTBREAKING how it has been treated, especially with LBP3 and the condition that game was in when RUSHED out the door, as well as how it is today. Im very into the Battlefield titles. Is Warfighter any good? Worth 5 bucks at least? Sorry, I meant to say Don’t Starve actually costs 1 cent more without the expansion. And the expansion by itself is still regular price at $4.99. My point is that there is no reason to buy it without the expansion, so why put both on sale? Grrr really want soul sacrifice delta I know it’s gonna be free real soon. Getting the wolf among us for sure though. Thank you Sony for the Vita sale! I bought TWD season 1 for vita for $5 last year, I want season 2 for vita, so put season 2 for vita on sale!!! Has anyone tried calling Sony to ask if they could remove games they’ve downloaded through plus? Mine runs out next month and there’s a few games here I actually want. I heard if you cancel it, those games still show up on the list, so you still can’t buy them.